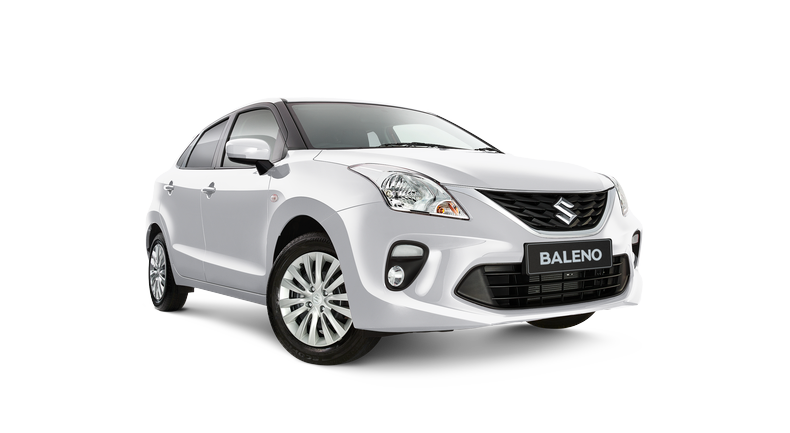 Building on Suzuki's extensive small car know-how, the stylish Baleno wraps a compact, aerodynamic body in elegant, sporty lines. But although it's sleek on the outside, inside it's a whole different story: you'll relax in an open, luxurious cabin with plenty of extra room for your legs, passengers or luggage. There's also extra space in the boot - 355L, in fact - which gives it even greater cargo capacity than the Mazda 3 Hatch. The Baleno also delivers outstanding efficiency, with fuel economy of just 5.1L/100km* - which beats both Corolla and Mazda 3. Plus, the Baleno is available in a Boosterjet turbo variant with a direct-injection system that combines greater power and acceleration with enhanced fuel efficiency and low emissions. Space, style and performance: it all comes together in the Baleno hatch. *ADR 81/02 results for manual transmission. NEDC Fuel Consumption figures may not mimic real-life driving conditions and should be considered for comparison against other vehicles only. The ultimate in user-friendly, the Baleno's advanced driver interface is hi-tech and high quality. The instrument panel features stylish curved lines and silver accents, housed in a smooth and wide dash. First up, there's a highly intuitive multimedia system with an easy-to-follow satellite navigation. Add to that Apple CarPlay® and a reversing camera and you have confidence and convenience at your fingertips. Use voice recognition to map out a route, call your friends or enjoy your favourite music. With a 7-inch touchscreen display taking pride of place in your dash, your cabin is filled with creature comforts as well as space. Apple CarPlay® is a registered trademark of Apple Inc. The Suzuki Baleno was awarded ‘2016 Australia’s Best Cars Award: Light Category. Judged by the Australian Automobile Association, the Baleno GL competed against 12 other vehicles in its category and received the coveted Australia’s Best Cars award. Launched in Australia in July 2016, the Baleno set out to redefine great value compact motoring with a car that has plenty of space and great styling all in which impressed the award judges. The Baleno GL also adds standard tech equipment such as a reversing camera, satellite navigation and apple car play. In a category where budget is the main focus, “Suzuki’s Baleno GL’s value for money and extra cabin space gets it across the line ahead of some well-credentialed and very competent opposition in this category”, the judges said. *ADR 81/02 results for manual and auto tranmissions. NEDC Fuel Consumption figures may not mimic real-life driving conditions and should be considered for comparison against other vehicles only. Apple CarPlay® is a registered trademark of Apple Inc. Android Auto, Google, Google Play and other marks are trademarks of Google Inc.
*ADR 81/02 results for auto tranmissions. NEDC Fuel Consumption figures may not mimic real-life driving conditions and should be considered for comparison against other vehicles only. Powered by a new Boosterjet direct-injection turbo engine in the GLX model, the Ignis is able to generate greater torque from lower speeds – thereby significantly improving fuel economy (5.2L/100km*) while lowering emissions. From city traffic to country cruising, the Boosterjet Turbo engine maximises Ignis’s performance, power and efficiency across all conditions. The economical petrol engine delivers the best of both worlds - with its intake VVT, cylinder head and piston crowns specifically designed to boost thermal efficiency and fuel economy (5.1L/100km^). From city traffic to rural getaways, the Ignis responds with power and precision. *ADR 81/02 results for turbo transmission. ^ADR 81/02 results for manual transmission. NEDC Fuel Consumption figures may not mimic real-life driving conditions and should be considered for comparison against other vehicles only. Slip into the driver's seat and the first thing you'll notice is the highly visible display unit at the centre of the instrument cluster - which gives a clear and constant picture of the state and running of the car. This advanced multi-information display has a 4.2-inch colour LCD screen (GLX Turbo) that intuitively conveys a useful range of information, such as running performance and engine output. The digital climate control in the GLX Turbo model features a unique circular display with a high-contract LCD panel for improved visibility. Whether you're doing the school run, the supermarket shop or going for a lazy Sunday afternoon drive to the country, the Baleno gives you plenty of room to move. The cabin proportions are generous to say the least: both driver and passengers experience an expansive sense of space, ease and comfort. And with an ample amount of cargo space in the boot (355L), the rear seats can be folded down to accommodate double that amount. You would never imagine how spacious the interior is, given the Baleno's exterior size. The rear seats offer plenty of leg and shoulder room so even adults won't feel cramped. The large and practical luggage space that meets the need of a range of uses from everyday shopping to family trips, while a luggage area cover ensures privacy. A selection of handy storage compartments here and there - for small items and drinks - makes the interior space seem even more generous. The Baleno’s design is both aesthetically pleasing and structurally advanced: it’s light, agile, dynamic and streamlined. Curved lines and flowing aerodynamics make its low, wide silhouette a bold, compelling visual statement. A new-generation platform – and all its parts – has been specially designed to optimise its shape, form and performance. By increasing rigidity and minimizing weight, the platform enhances fuel economy, safety, handling, and stability. It also helps minimize noise, vibration and harshness (NVH). While a low, wide muscular stance adds extra stability, the MacPherson strut coiled suspension senses your every move, enhancing manoeuvrability, responsiveness and driving enjoyment. When we say that it all comes together in the Baleno, that equally applies to its standard range of integrated safety features. These standard features include, dual, front, side and curtain airbags, Electronic Stability Control (ESC) and Suzuki’s unique Total Effective Control Technology. While the latest braking technology (ABS, EBD and BA) provides even greater levels of control and reassurance. Also standard are a Rear View Camera with guidelines, LED Daytime Running Lamps and Fog Lamps for further enhance visibility and safety.